Have a mug of hot gløgg (pronounce « glug ») with some æbleskiver (pronounce « eble skiwa’ », something like that…), pancakes shaped like little balls to eat dipped in jam, and you’ll have a taste of Danish Christmas. They’re being sold everywhere across the city for a few weeks. So, what are they exactly? It’s a kind of mulled wine famous all over Scandinavia and commonly served for St. Lucy’s Day on December 13th and all over Christmas time. The gløgg is made of hot wine in which we infuse different spices with a bit of Port wine. It is served very hot with sliced almonds and raisins soaking at the bottom of the mug, and perhaps a drop of strong alcohol – brandy, rum, vodka, or aquavit (the Danish schnapps) depending on the recipes… or the local temperature, I assume. The longest the gløgg marinates, the better it tastes (even if one generally never manages to let it marinate very long…). So, you can make it the day before and leave the spices to infuse to get a more aromatic result. I’ve read many different recipes to finally make up my own, and it tasted pretty good (also according to others!). Contrary to what most of the recipes said, I insist you should choose a nice mid-priced wine: not among the cheapest ones nor a cheap Port. I’m not saying that you should use a 10-year-old bottle of wine but we can’t make a tasty gløgg with vinegar. And life is too short to drink bad wine. Don’t you think? * I peel large strips of skin with a peeling knife and then cut them into very thin strips with a sharp knife. You can leave them to marinate in some port beforehand for even more taste. In a saucepan, pour the wine and the Port. Add the roasted spices, the slices of lemon and orange skins, and the sugar. Low heat the mixture until it simmers and keep it at this temperature for a few minutes before turning it off. Be careful not to boil the mixture. Ideally, let it infuse for a few hours. Reheat before serving. Put a teaspoon of blanched sliced almonds and a teaspoon of raisins in a mug, then pour some hot gløgg onto it. Add a drop of strong alcohol (cf. Ingredients) if you wish to. Serve immediately. First of all, to make æbleskiver, you need a special utensil: an æbleskiver pan. That’s a pan with a few hollows to give the pancakes their spherical shape (or at least try to). To find one, I simply went to one of the second-hand goods dealers next door, down the corner of Ravnsborgade and Sankt Hans Gade in Nørrebro district. It’s a common thing here. And you will also need two wooden sticks (like wooden skewers) to flip them over easily – or knitting needles like back in the old days. 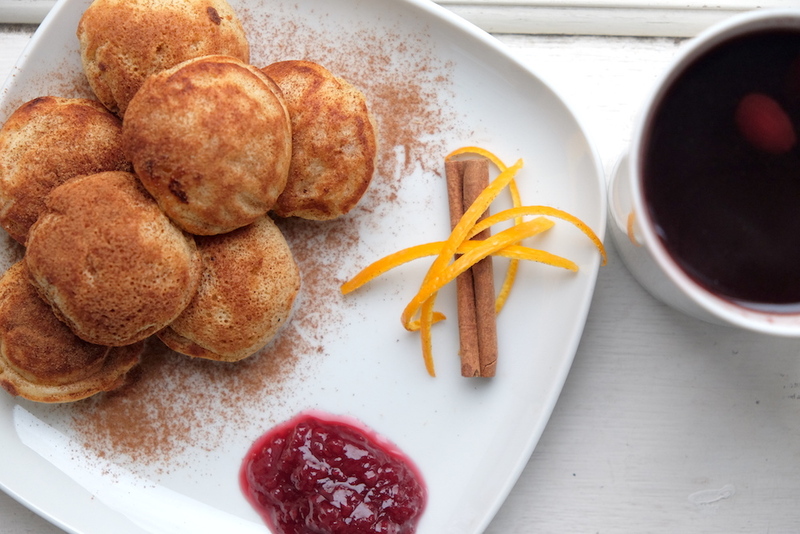 If you don’t have any æbleskiver pan (it’s OK, you know! ), I’ll give you an option further down to cook them without – and not let your mouth water forever. Put the whites and the sugar in a bowl. Set aside. Put the rest of the ingredients in another bowl and stir well to a homogenous and smooth consistency. Whip the whites with the sugar until stiff. Gently incorporate the whites into the mixture. You can use a spatula while stirring to make the batter lighter and avoid ruining the egg whites. Peel and cut the apple into 0.4-inch/1-cm dice. Heat up the æbleskiver pan. When hot, put a knob of clarified butter or coconut oil in each hollow and spread with a pastry brush. Fill in ¾ of each hollow with batter and put an apple cube in the middle. Let it cook for a few minutes and flip the æbleskiver over with two wooden sticks (they should easily come off the pan when cooked on one side) and allow to cook the other side. The æbleskiver should be lightly brown on each side. Spread with icing sugar or ground cinnamon, and serve with jam. In this case, rather make blinis (small pancakes). In a large greased hot frying pan, pour the equivalent of a tablespoon batter to form 2.5-inch blinis and push an apple cube in the middle. Repeat the operation to make several ones in the pan. Flip the pancakes over quickly to cook the other side. Why æbleskiver have that ball shape? And if you’ve been brave enough to get to the end of this long post, you’ve won this little story, which could be the real legend of the æbleskiver… or not. What are your favourite Christmas specialities? Where do they come from? Other Danish recipes? This way. Veron they sound absolutely yummy. Add to my Christmas panettone passion. Don’t think I’ll be losing my European holiday kilos anytime soon! Thanks Marion! And the good think is that it’s not too heavy. Love Panettone too! Should ask my Italian friends for a good recipe.